This is the start of Banned Book Week. 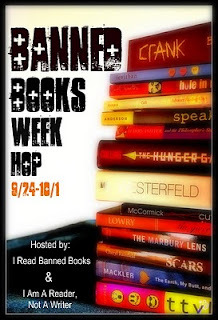 In honor of it I am participating in the Banned Book Week Giveaway. I remember when I was young watching a movie where books were being burned and the effect it had on me, (the image was forever burned in my mind). I do not profess to like every book out there. There are books I have read that I wish I had not wasted my time. Most definitely there are books that I do not agree with. But I do not feel a book should be banned just because I do not appreciate it's content. I think that is the beauty of a book. That you can talk about it and how it affects you, what you think of it and why you disagree with it. Freedom of speech is our right in the United States. I get worried when people start up talking about banning a book because they are in a sense trying to remove that right. I worry when some of our elected ones start using the word privilege in regards to freedom of speech. Freedom of speech is not a privilege in the United States. It is a RIGHT protected by the Constitution. The First Amendment protects freedom of expression and includes the written word. When you start calling it a privilege it becomes something that can be taken away. After all, as a form of punishment, do you not restrict your children's privileges, (or if you have no children, were your privileges restricted by your parents)? We need to pay attention to that word so that we maintain our rights. Remember you can choose which books you read. For many years you can choose what your children read. For those same years you can influence your children in the types of books you value. When they reach the age of choosing for themselves, you can discuss why you have an issue with a certain book, (once again taking an opportunity to instill your values). If a book is banned you lose that opportunity. We all lose. Honor all those throughout history who fought for our right to say and read what we choose. 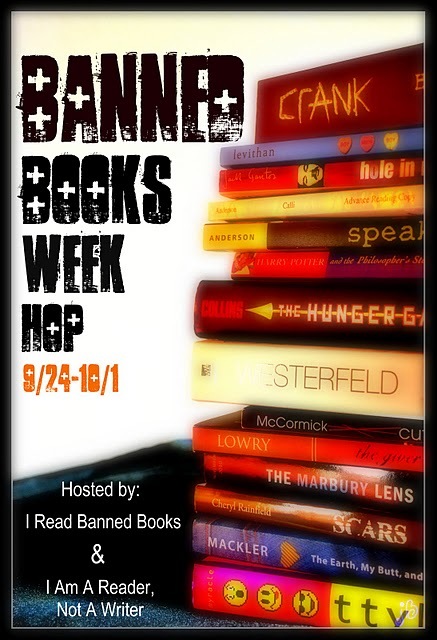 Do it by taking the opportunity this week to pick up a banned book. Read it and then discuss it with someone. You will then be exercising both a right and the privilege. Leave all comments for the Giveaway below please. If you are choosing not to enter the giveaway or are unable to participate please comment. Your thoughts are welcome. I do apologize for this being US only but I do not know the laws in every country regarding Giveaways. I don't think books should be banned either. It's our right to read what we want. When it comes to YA, parents should be involved in what their child is reading and have discussions with them about it. I would like to read The Marbury Lens by Andrew Smith. Books shouldn't be banned. It is are right to read what we choose. I haven't read Hunger Games by Suzanne Collins. I would love to win it. I saw it on the Banned/Challenged list. I couldn't believe the books they had on that list. Thank you both for the comments and stopping by. Peggy I think the parents who read to their children when they are young and talk about the story with their child have an easier time keeping that open book talk going when their children are teens. I'm a huge advocate of teaching a small child how to choose books and then supervising over their picks. I always read the same book my teens were reading so I could talk about it with them. When my son went off to college he would call me with his list of reading and I would buy my copy so we could talk about them. (Yes, I have read some very dry books now. lol) I think it just progresses smoothly if you maintain the reading time link. Amy, I know. I was amazed at some of the books on the list too. There where even a few that people wanted banned that were not even written yet! The House of Night series by PC Cast and Kristin Cast is one of those. They wanted to ban current books in the series and FUTURE books in that series. How can you talk of banning a book that isn't even written? I am always amazed at what books are banned, such as Judy Blume, which were such a big part of my reading growing up! The Goosebumps books? Come on!! I refuse to let somebody else tell me what books I can read, and what books I allow my children to read. I've taken this opportunity to discuss this with my kids, and they know that I am totally opposed to it. I think if nothing else, this has given me, and hopefully other parents out there, the chance to discuss this topic with our kids. wow when i went to school they were on the required list to read, thanks for having this tour. We should be encouraging not discouraging reading. I am not sure which book I would like to read, too many. i want to read the handmaid's tale!! I definitely agree with you that parents remove a lot of learning opportunities for their children when they just automatially forbid a book, etc. without discussing it. I've listened to the audiobook of Farenheit 451 (from the library), but I would love a print copy of my own. Thanks for the giveaway! You make a good point that banning a book is a lost opportunity to make a choice. If a parent wants to remove that opportunity to choose from their own child, that's one thing, but I definitely don't need them making decisions that affect my child's opportunities to make those choices. Banning books from school libraries takes choices away from all of the kids and parents. One of my biggest pet peeves is when people try to impose "their" judgments on me. A prime example is book banning. Harry Potter--seriously?!?! That series is one of my favorites and isn't any more "evil" than some of the so-called "fairy tales". And "Goosebumps"??!? I can remember reading those to my son when he was little. Those books aren't any more scary than "Hansel & Gretel". All people's perceptions are different and just because you don't agree with my "perceptions" doesn't make it wrong. Anyway...thanks for the giveaway and for participating in this blog hop! Not entering giveaway but wanted to thank you for your post. The American Library Association website for banned/challenged books--short list for classics only--includes To Kill a Mockingbird, by Harper Lee; 1984, by George Orwell; A Farewell to Arms and For Whom the Bell Tolls, by Ernest Hemingway; Gone with the Wind, by Margaret Mitchell; and Sophie’s Choice, by William Styron. The first four were required reading in my school days. A commenter on Murder She Writes, however, took me aback by mentioning the Bible, which of course is banned in some places. I came by to personally thank you for participating this year! There are a ton of books on the list that I have read and want to read. I read Fahrenheit 451 and One Flew Over the Cuckoos Nest and want to read Catch 22, Of Mice and Men, and many others. I would love to read either Animal Farm or 1984. I've never read those! Thanks! I swear some of the books on these lists made my jaw drop. I have read To Kill a Mockingbird. I would like to read Hunger Games by Suzanne Collins. I don't agree with banning books either every child will mature at different times and it is up to the parent to decide what their child can read. I would love to read The Hunger Games and I have read To Kill a Mockingbird. thanks for the giveaway! I would like to read The Hunger Games. It is on my TBR list and was totally suprised that was on the banned list. I am dying to read The Hunger Games - EVERYONE has read and is talking about it. I have to see what all the excitement is about! Harry Potter is my favorite banned book. Twenty Boy Summer by Sarah Ockler is the banned book at the top of my wishlist! I would love to read it!! I'd like to read The Kite Runner! One of the ones that interests me the most is The Grapes of Wrath. I have a feeling that I read it my freshman year of high school, but don't remember a whit of it. I feel that books should not be banned. Every story matters and should be appreciated. I am trying to keep my comments to a minimum in this post but I did want to say how much I appreciate all of your thoughts on this. Thank you all for coming by and commenting. I love love love the Harry Potter series :) I think it's devastating that it's been banned. I'd love to win any one of the books 1-6 since I already own the 7th one :) Thanks for the giveaway! Banning books definitely does more harm then good. Why take away the very materials that move us forward? I love the Harry Potter series, but unfortunately own none! I would love to win any of them. :) Thank you so much for the giveaway! I would love to read "Speak"
I love the Harry Potter series and I would love to read Wintergirls by Laurie Halse Anderson! I have lots of favorites, but Catcher In The Rye and The Hunger Games are definitely part of them. I've been wanting to win/read Speak by Laurie Halse Anderson and Crank by Ellen Hopkins. I would love to read The Color Purple, the Hunger Games, or Brave New World. I would love to win catching fire by suzanne collins of the hunger game series. As much as I hate some books and find them potentially damaging to certain age groups, I don't agree with book banning either. I'm not about to police someone else's reading time because they don't have the right to police mine. My favorites are probably Bridge to Teribethia (which I had an unhealthy obsession with as a child) and Brave New World. Oh! And The Giver, which is possibly one of the best books ever! I'd love to read Slaughterhouse-Five, A Wrinkle in Time and Flowers for Algernon. Thank you for taking part in this blog hop! I really want to read twenty boy summer! Thanks for the great giveaway! Some of my favorite banned books are Of Mice and Men, One Flew Over The Cuckoo's Nest and A Light In the Attic. I've been wanting to read The Perks of Being a Wallflower. My favorite banned/challenged book has to be either Speak or the Harry Potter series. Lush, by Natasha Friend looks to be really interesting. I agree with your distinction btwn "right" vs privilege when it comes to freedom of speech. I have read and enjoyed several banned books such as Animal Farm and Lord if the Flies. I would like to read Crank. Thanks for this awesome giveaway! My favorite banned book has to be The Hunger Games. It's just an awesome book! I have been wanting to read the Hunger Games. I would love to read Speak. I have heard a lot bout it. Thank you everyone for your interesting comments. It is truly heartening to see so many who agree that banning books is what should be banned. It is important to keep our right to choose what we and our children read. The only way to do that is through awareness, education and reading those books. I appreciate every one of you.